C.L Taylor is back with an exhilarating new book in 2019 called ‘Sleep’. All Anna wants is to be able to sleep. But crushing insomnia, terrifying night terrors and memories of that terrible night are making it impossible. If only she didn’t feel so guilty. To escape her past, Anna takes a job at a hotel on the remote Scottish island of Rum, but when seven guests join her, what started as a retreat from the world turns into a deadly nightmare.Each of the guests have a secret, but one of them is lying – about who they are and why they’re on the island. There’s a murderer staying in the Bay View hotel. And they’ve set their sights on Anna. Seven strangers. Seven secrets. One deadly lie. ‘Sleep’ is the latest book by C.L Taylor and it’s an intense, claustrophobic thriller that really does dare the reader to sleep. The story is mostly seen through the narrative of Anna Willis, who’s life falls apart when the car that she was driving was involved in an accident killing two of colleagues and leaving another one paralysed. Suddenly single and unsure of what to do next, she finds herself working on the only hotel on a remote Scottish island. Hoping for a new start, where the tragedy that she encountered is left behind, she discovers that someone knows her secret past and is leaving threatening notes. The story is also seen from the perspective of the people that the accident really impacted on, along with the seven guests at the hotel as well as a person who is obsessed with death and helping those along with a peaceful journey. Like C.L’s previous books, this book was a dark and obsessive read that really gripped my attention. The bleak and remote setting of the story gave a really stifling element as Anna feels the island and the guests of the hotel closing in on her as they all begin to die one by one. The story is cleverly written at a fast pace that really engages the readers with short and snappy chapters that really hooks the readers attention. 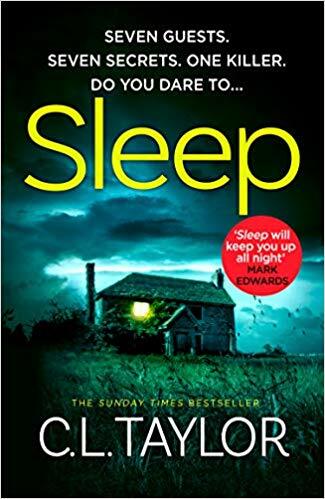 With unpredictable and suspicious characters that makes everyone a suspect in this thrilling tale, ‘Sleep’ is an electrifying tale that will leave the reader restless until they reach the final page. You can pre-order Sleep from Amazon and will be available to buy from good bookshops from 4th April 2019. I’ve just finished this book and fans of C.L. Taylor are in for a rollercoaster of a journey.